Chinook SalmonWe have known for years that the Smith River is critically important as a refuge for wild salmonid species. Now the Smith River is officially recognized as a “Salmon Stronghold” — the first such designation in California. 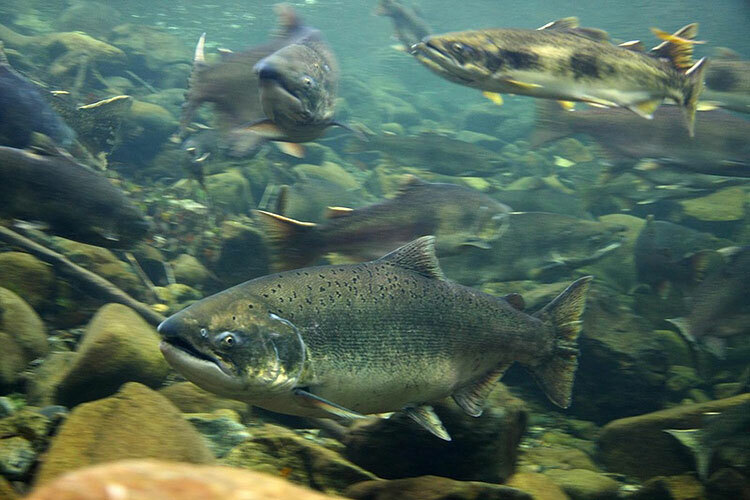 Federal legislation was introduced in September — the Pacific Salmon Stronghold Conservation Act to provide federal support and resources for collaborative, high-value conservation projects in a network of the most abundant, productive, and diverse wild salmon systems. Upon enactment, resources would be made available for conservation efforts in stronghold basins across Washington, Oregon, Idaho, California, and Alaska. Here on the Smith, we are continuing to work with our many public and private partners to advance key habitat restoration, protection, and education projects to benefit our native fish and wildlife species — and our local community. This newsletter provides a brief summary of our progress. The Cedar Creek salmon barrier removal project is the excellent example of habitat restoration that serves all salmonids including coho salmon, a species listed as “threatened” under the Federal and California Endangered Species Acts. 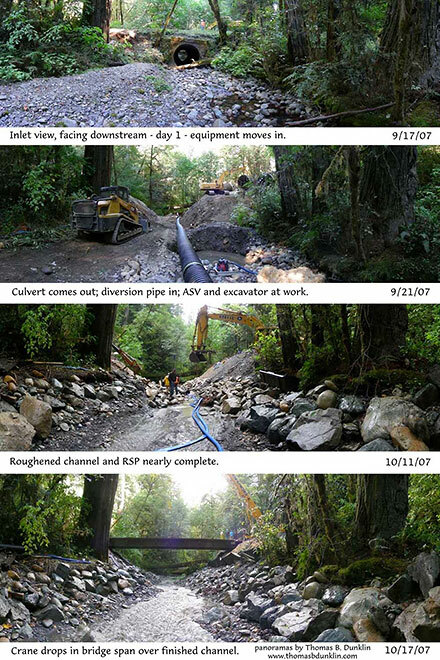 The project involved removing a culvert that has been a barrier to fish migration since 1947, restoring the natural grade to the channel, and constructing a bridge at the site to enable continued use of Howland Hill Road, a historic gravel road through the towering ancient redwoods of Jedediah Smith Redwoods State Park. The above photo sequence highlights the progression of work. Removal of the old road culvert at Cedar Creek allowed salmon to access over one mile of excellent spawning and rearing habitat upstream of the culvert. This project was identified as priority in the Smith River Anadromous Fish Action Plan (2002, by the Smith River Advisory Council) and the Recovery Strategy for California Coho Salmon (2004, by the California Department of Fish and Game). SRA initiated design and planning for the project with $11,000 in private funds, which were matched by the California Department of Fish and Game (DFG). Following design and planning, DFG awarded a grant from the Fisheries Restoration Grant Program to implement the project. Work was completed in the fall of 2007. Special thanks to DFG, the Smith River Advisory Council — our local partner, an outstanding project team including Pacific Coast Fish, Wildlife, and Wetlands Restoration Assn., Michael Love and Associates, Winzler & Kelly Consulting Engineers, and a supportive landowner — California State Parks. Restoration work continues on Mill Creek — one of the best producing salmon and coho streams in California — and more funds have been committed. In November, the Wildlife Conservation Board (WCB) approved a second three-year grant to SRA to continue the integrated program of habitat restoration on the 25,000-acre Mill Creek property. This grant — and matching funds from project partners will fund the restoration and decommissioning of approximately 29 miles of roads. These roads are at-risk of failing into important salmon-bearing streams and their tributaries. The grant will also fund the revegetation of approximately 120 road–stream crossing areas; the restoration of 93 “landings” from previous timber harvest operations; and the stabilization of 72 landslides. Mill Creek RestorationThe Mill Creek property was purchased in 2002 through the cooperative efforts of DFG, WCB, Save-the-Redwoods League, California State Parks, State Coastal Conservancy, SRA, and California Trout. These partners along with the Regional Water Quality Control Board, Redwood National Park, and a number of private foundations have worked together to secure and obligate over $10 million in restoration funding since 2002. Salmon spawning tours: Save-the-Redwoods League, North Coast Redwood Interpretative Association, and Redwood National and State Parks are working together to lead weekend salmon spawning tours on the Mill Creek property. To register, please call 707 465-6191 and ask about the spawning tours. Hurdygurdy Creek ConfluenceSRA is continuing the effort to protect the 5,400-acre Hurdygurdy Creek property, which is the last large remaining private inholding in the Smith River National Recreation Area (SRNRA). Eighty percent of the land is within the Hurdygurdy Creek watershed — one of best producing salmon streams in the SRNRA. A detailed habitat assessment of Hurdygurdy Creek was completed this fall on the 14 miles of this stream which is accessible to salmonids. 334 steelhead and salmon redds (spawning nests) were identified in this reach. Hurdygurdy Creek and salmon strongholds in the news! For the June 14, 2008 Sacramento Bee Op Ed by U.C. Davis Professor of Fisheries, Peter Moyle and former Oregon Governor John Kitzhaber click here. During 2008 SRA secured support and endorsements from a diversity of fisheries and conservation partners including the Pacific Coast Federation of Fishermen’s Association, California Sportsfishing Protection Alliance, California Trout, Del Norte County Fish and Game Advisory Commission, Wild Salmon Center, Nature Conservancy, Sierra Club, National Wildlife Federation, the Wilderness Society, and many others. We will be working with these partners and other stakeholders to secure funding for the purchase of this nationally significant project area in 2009. Stay tuned. The 11th Annual Coho Confab — a symposium to support education and training about restoration for salmon species — especially coho — was held at Rock Creek Ranch on the South Fork Smith River this year. It was a great success with over 100 people in attendance and three days of watershed-wide tours and workshops as well as evening speakers at the Ranch. The Confab was hosted by the Salmon Restoration Foundation, Trees Foundation, California Trout, Smith River Alliance, and the Smith River Advisory Council. This is the largest such event that has ever been hosted at the Ranch — and judging by the appreciation of the participants, there will Coho Confab at Rock Creek Ranchbe many more to come. Highlights included field trips to the Mill Creek project area for workshops on the integrated restoration work there, a Klamath River salmon cook-out compliments of the Yurok Tribe, and traditional stories over the campfire by Frank Lake, Research Ecologist with the U.S. Forest Service.